On the eve of the most important midterms of our lifetimes, Donald Trump was out in Ohio keening that he can’t call his daughter Ivanka—or any woman—beautiful anymore, implying the Political Correctness Stasi (his own staff?) will stick his orange head on a pike like a pumpkin, as though that’s the main problem here and not that he clearly still wants to bone his daughter. 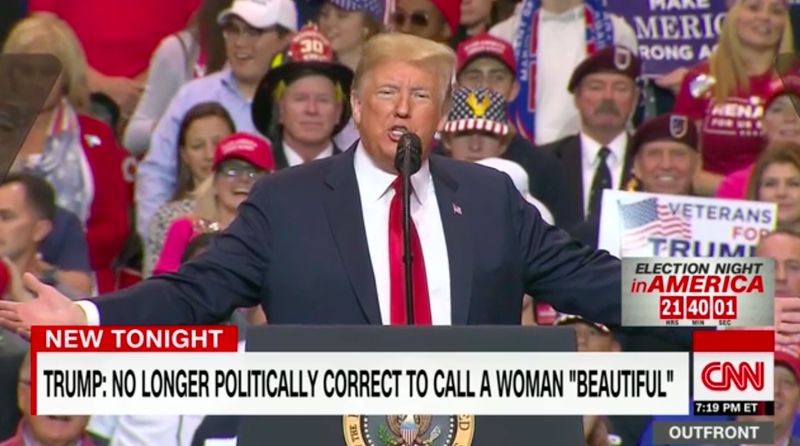 “The truth is, she’s a very, very...you’re not allowed to use the word ‘beautiful’ anymore when you’re talking about women...” Trump said, to great harrumphs of disgust from the audience. “I will never call a woman beautiful again!” he declares. “I’m not allowed to say it, because it’s my daughter Ivanka...but she’s really smart,” he says dreamily, forcing me to throw up repeatedly over the starboard side of my blog ship. Also, why does he suddenly think that? This is a man who was caught on camera before he was elected bragging about the sexual assaults he’s committed, and yet here he is, still in office two years later. If anything, he can say whatever he wants, including but not limited to that he wants to get with his daughter. I now invite you to revisit this compilation of all the times prior to the election that Trump made sexual comments about his own flesh and blood. Sorry!